When a predator at or near the top of the trophic web has a pronounced effect on the abundance or distribution of its prey, the potential exists for the influence of that predator to extend beyond its immediate prey and ramify throughout the food web. In systems where algal-grazing fish are abundant, the amount and distribution of algae can be determined by the activities of piscivorous birds (Power 1984b) or fish (Power and Matthews 1983). In small, Midwestern US streams during low flow, pools separated by shallow riffles typically exhibit a striking complementarity between an algivorous minnow (Campostoma anomalum) and piscivorous bass (Micropterus). In addition, algal abundance varies inversely with the number of minnows. When a bass-free pool was divided longitudinally and Campostoma added to one side, algal standing crop was markedly lower on the side containing minnows. Addition of bass to Campostoma pools immediately resulted in these minnows restricting their grazing to shallower regions, and so algae were heavily grazed along pool margins but abundant in deeper waters (Power et al. 1985). A number of variables, including the identity of species in the assemblage and environmental factors, can determine whether top-down predation has strong effects on the entire assemblage. The presence of steelhead trout induced a trophic cascade among the biota associated with boulder-bedrock substrates in pools of a northern California river during summer base flow (Power 1990, 1992b). By suppressing densities of damselfly nymphs and other small predators, fish released algivorous chironomids from predation (Figure 911). In the presence of fish, chiron-omid grazing reduced filamentous green algae to low, prostrate webs, whereas an upright algal turf developed when fish were excluded. These effects were documented during the summer low-flow period when large pools become nearly lentic; during winter, scouring flows are an alternative mechanism that reduces algal densities. Strong top-down effects on the benthic food web are unlikely to occur whenever the top predator exerts modest predation pressure on intermediate trophic levels. This appears to be true for trout when the infall of terrestrial invertebrates provides an abundant alternative prey. 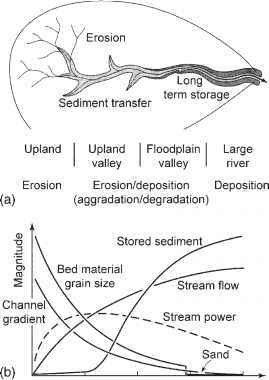 In a forested stream in Japan, Nakano et al. (1999) used a combination of greenhouse-type covers to manipulate terrestrial insect infall and instream cages to manipulate fish distributions to show that rainbow trout induced a trophic cascade when terrestrial inputs were low, whereas high invertebrate infall suppressed the cascade. Despite strong effects of trout predation on some invertebrates, Meissner and Muotka (2006) did not observe any response of periphyton, possibly because the food web was largely detritus-based, and perhaps because trout had no effect on grazing Baetis and may have benefited midge larvae. There is some evidence that the strength of a trophic cascade depends on which species of predator is present. A more pronounced reduction in benthic invertebrates within fish enclosures occurred in the presence of the bullhead sculpin Cottus gobio than with brown trout (Dahl 1998). These sculpins were benthic feeders that reduced the abundance of a variety of macroinvertebrates, whereas trout fed mainly on drift and had only a moderate impact on a baetid mayfly. 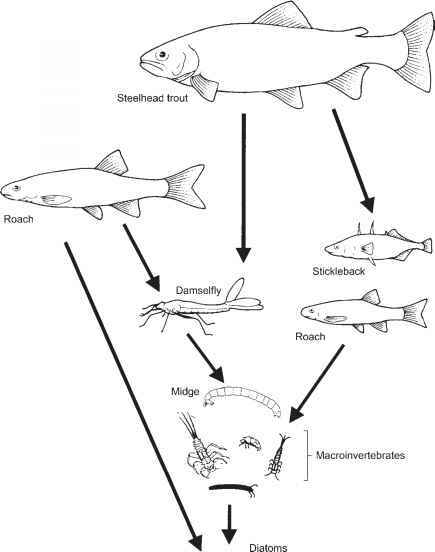 Because 80% of trout diet consisted of terrestrial invertebrates, the different effect of the two fishes may reflect differences in their ability to utilize terrestrial inputs. Introduced trout in New Zealand streams have brought about a fascinatingly complex series of changes in stream food webs. Although clearly an unnatural event, studies of the impacts of invasive trout provide convincing evidence of its complex, system-wide influence (Huryn 1996, Town-send 2003). The native fishes, vaguely trout-like members of the family Galaxiidae, are competitively displaced by brown trout, invertebrate abundances are reduced, and, in a trophic cascade, algal blooms result from reduced grazing pressure. Trout have a marked influence at the ecosystem level, as streams with trout have substantially greater primary production, invertebrate secondary production, and fish production, and they export surplus algal production. Native galaxiids occupy the same trophic role as trout, but have at best weak effects, causing a "trophic trickle'' rather than a cascade. In summary, predation in stream ecosystems unquestionably exerts a direct influence upon prey populations. Predator foraging mode and prey vulnerability result in differential predation rates that constitute a strong force driving adaptations to minimize predation risk. In some circumstances predators clearly are able to exclude prey species from certain habitats or markedly reduce their abundance. The immediate effects are lost foraging opportunity and reduced growth rates, or direct mortality, which affects some size classes and species more than others. Because the prey themselves are consumers of other animal or plant resources, the potential exists for predation to create top-down trophic cascades and indirectly affect other species in the food web. In fact, some of the most dramatic effects of predation in lotic ecosystems are revealed in far-reaching cascades, offering convincing evidence that predation is a strong force shaping biological communities.